Looking for something light and delicious to serve to your friends mid-morning? Try making some sugar free pastries. These scrumptious, traditionally sweet snacks can be made without sugar and are just as mouth-watering. Fillings can be made in all sorts of flavours and the pastries can be served with a generous blob of cream, or even sugar free ice-cream, if you want to be really indulgent. Experiment with different fillings to find textures and flavours that work well for you with the light, flaky bite of the pastry and try using fruit of the season where possible. Find nice sweet pears for this recipe. 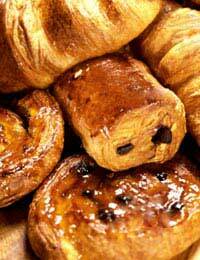 Those who enjoy sultanas in their Danishes can add a handful when cooking up their fruit. Start by making your pastry. Take a large bowl and in it mix your dry ingredients (flour, salt, yeast and sweetener). Slowly stir in your warm water until you have a good dough. Knead for five minutes and then wrap in cling film and chill in the fridge for at least an hour. Soften your butter. Lightly dust a surface with flour and roll your pastry out into a long rectangle. Roll out one third of your butter and place on top of half of your dough. Fold the dough over to sandwich the butter and chill again for about half an hour. Repeat the process twice more. Wrap in cling film again and leave to chill for another hour. Wash, peel and core your pears and place in a saucepan with your apple juice. Cook down to a puree. Preheat your oven to 200 deg C/400 deg F/gas mark six. Dust your surface with flour again and roll out your pastry to make two long rectangles. Cover one with the pear puree, then place the other one on top. Seal the edges to keep the filling in. Cut into slices. Beat your eggs then brush on top of each pastry. Place on a greased baking sheet and cook until risen and golden brown on top (usually 20 minutes). Brush with a little sugar free apricot jam. This is a nice summery recipe. Serve it with fresh whipped cream or sugar free ice cream. Once again, start by making your pastry. Take a large bowl and in it mix your dry ingredients (flour, salt, yeast and sweetener). Slowly stir in your warm water until you have a good dough. Knead for five minutes and then wrap in cling film and chill in the fridge for at least an hour. Soften your butter. Lightly dust a surface with flour and roll your pastry out into a long rectangle. Roll out one third of your butter and place on top of half of your dough. Fold the dough over to sandwich the butter and chill again for about half an hour. Repeat the process twice more. Wrap in cling film again and leave to chill for another hour. Wash and hull your strawberries, making sure you pick out all bits of leaf. Beat your yoghurt and sugar free jam together. Then carefully stir in your strawberry pieces. Preheat your oven to 200 deg C/400 deg F/gas mark six. Dust your surface with flour again and roll out your pastry to make two long rectangles. Cover one with the strawberry mixture, then place the other one on top. Seal the edges to keep the filling in. Cut into slices. Beat your eggs then brush on top of each pastry. Sprinkle with flaked almonds. Place on a greased baking sheet and cook until risen and golden brown on top (usually 20 minutes). Brush with a little sugar free apricot jam.